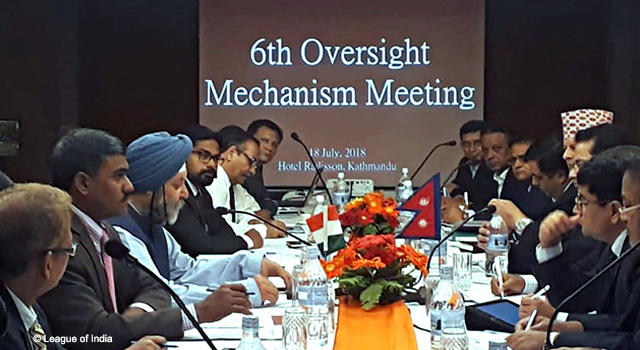 The 6th Meeting of India-Nepal Oversight Mechanism reviewed progress of ongoing bilateral projects between India and Nepal. This included cross-border rail projects, integrated check posts, Terai roads project, cross-border transmission lines, and the Arun-III hydropower project. The Oversight Mechanism aims to address issues in implementation of India-Nepal economic and development cooperation projects to facilitate their early completion. The Meeting discussed measures to be undertaken by specific Government agencies to expedite project implementation and achieve early or on-time completion of projects within the specified time frame. The meeting was co-chaired by Mr. Manjeev Singh Puri, Indian Ambassador to Nepal, and Mr. Shanker Das Bairagi, Foreign Secretary of Nepal.